A new solo project arrives for Gamora, the cool, green super heroine, who is deserving of her own series. The Guardians of the Galaxy (2014) film popularized the character (portrayed by Zoe Saldana) who gained a broader audience. More spin-offs were inevitable after the popularity of the movie and the planned sequels. The screenplay writer from Guardians of the Galaxy, Nicole Perlman, is penning this series. Perlman is also co-writing the upcoming Captain Marvel film. The new comic series acts as a form of prequel. We all know that Gamora, before becoming a Guardian, was the personal assassin of Thanos, and is his adopted daughter. Ever wondered why Gamora turned her back on Thanos and joined the good guys protecting the galaxy? Gamora #1 will explore the earlier history of the character and just what inspired the change of heart. 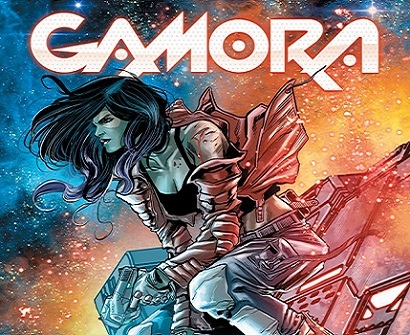 We are also promised that the comic series will depict Gamora embarking on a journey of revenge and redemption, and explain how she earned her reputation as the deadliest woman in the galaxy. Artist Marco Checchetto (Ghost Riders, Star Wars) is providing the illustrations. Andres Mossa and Esad Ribic are on colors and cover duties respectively. The release date for issue #1 is December 21st.